March 22, 2015|Posted in: Holidays and Seasons, Let's Eat! 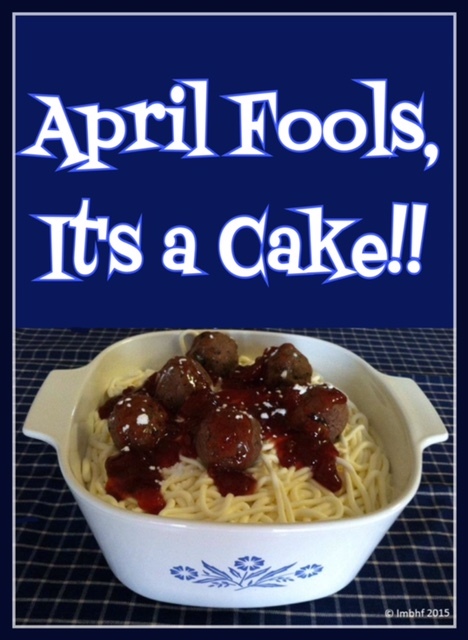 Your family and friends will love this fun and yummy April Foo’ls Day prank! It’s a cake that looks like a Spaghetti Dinner!! Bake a cake in an oven safe serving dish. Any recipe or boxed mix will do. Watch it carefully during baking since differently sized baking dishes will require different amounts of baking time. Be sure not to over or under cook your cake. Allow cake to cool completely. Combine all the ingredients in large mixing bowl and mix at slow speed until smooth. If frosting is not stiff enough add more confectioner’s sugar 2-3 tablespoons at a time. Frost the top of the cooled cake with a thin 1/4″ layer of frosting. Attach a size 12 (or similar size) decorating tip to a decorating bag and fill it with frosting. Crush the cookies to a crumbly consistency. Mix together with frosting and cocoa. Stir well, one jar of Strawberry Preserves. If necessary add water 1 tsp at a time until it is the consistency of thick spaghetti sauce. Pour mixture over the top of the cake to look like spaghetti sauce. Crush one or two vanilla wafer cookies and sprinkle over the top of the cake to look like Parmesan Cheese. Serve the prepared Spaghetti Cake to your family and friends and watch their looks of surprise and confusion turn to joy as they enjoy the delicious dessert! “Ice Cream Cone” Rice Krispie Treats! Here are some related products from Amazon that you might like. Just click on the photo or the description to be redirected to Amazon where you can purchase the product. WOW! What a great idea and it looks so much like spaghetti!!! Thank you for sharing this post at the #WednesdayAIM #LinkUp #BlogParty. I shared it on social media. It is so much fun to make! Thank you for Sharing on social media. It’s fun, isn’t it? Thank you Emily!!! Oh my god that’s genious! If I can find a way to “veganize” this recipe (substituting butter and milk shouldn’t be a problem), I will definitely make this recipe for my friends as soon as possible! Stopping by from Sunday’s Best. I love, love, love this idea. It looks just like spaghetti. I’m pinning this one, lol! Thanks for sharing. I love this idea! I don’t know if I can wait until April to try it on my grandchildren! Very clever! I can’t wait to try this! Hi Lori what a fun idea and they really looked like spaghetti and meatballs! I’m sure you have tricked many on April Fool’s Day with that recipe. Thanks for linking up and sharing with us at #BloggingGrandmothersLinkParty. Have a great weekend. Well, that’s just an awesome idea! Thanks! « Six Tips to Choose to Be Happy!